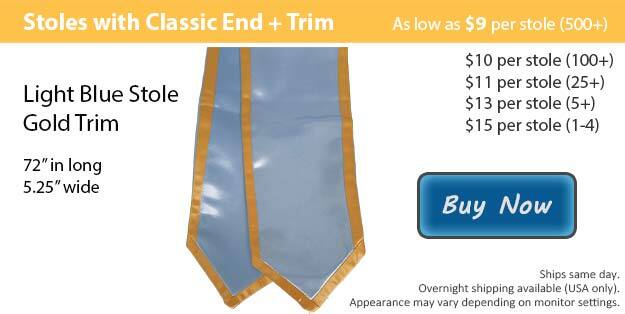 We have a light blue graduation stole with gold trim that would be a great choice for your special group or club. As you approach your graduation this year, allow Honors Graduation to help you with your wardrobe. We have just what you need to be dressed perfectly for the occasion. From the traditional basic items like your cap and gown all the way to customized accessories that pull your graduation outfit together. At Honors Graduation we know that you have worked long and hard, dedicating years of your time to achieve all the things you have. That's why it is so important to look your best on this huge day in your life. Your closest friends and your family come from all around to cheer you on and help you celebrate the success you truly earned. As you accept your degree or diploma be sure to reflect on all the obstacles that stood in your way and how with the right level of determination you are able to overcome anything. A graduation stole is a distinguished way to represent yourself at the time of your ceremony. Honors Graduation has eighteen different stole color options to choose from, each one is available with any color of trim to give you the contrast you are searching for. If you would rather have a single colored graduation stole, we do have all of our colors available without trim as well. All of the color combinations that we have in stock come in two different finish cuts. There is the classic option or we also have an angled cut. If you want to add your own personal touch to your stole, our customization team can add the wording or an image of your choice by embroidering it onto your stole.